It isn’t just people who are prone to food allergies but their pets as well. When it comes to cats, some of the most common allergies involve dairy, corn, and seafood of a wide variety. A great deal of effort can go into ensuring that your beloved pet gets the nutrition it needs, especially if you are a responsible owner. At this point, we should point out that hypoallergenic cat food does exist and that it isn’t exactly easy to come by. It is for this reason that you should take the time and learn as much as you possibly can about such food and whether not your cat likes it. 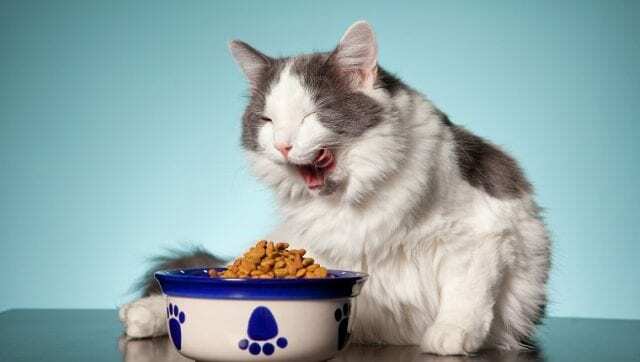 To give you a good idea of what’s out there, we put together a list of the ten best hypoallergenic cat food money can buy. 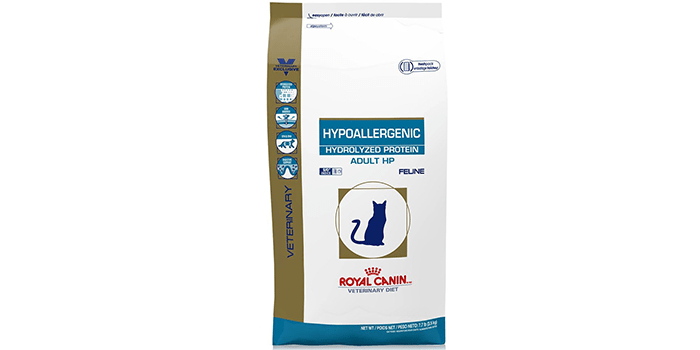 Ideal for adult cats, the ROYAL CANIN Feline Hypoallergenic Hydrolyzed Protein Adult Cat food features a low content of wheat-soy protein along with carbohydrates and chelated minerals which are easily absorbed and which help with your cat’s digestive and immune system. Perfect for healthy skin, it is blended with omega 3 fatty acids and aims at restoring health and nourishment back to your cat’s intestinal tract. Thanks to the B-vitamins and amino acids present in its unique formula it forms a barrier for the skin and helps in preventing any health issues or reducing allergic reactions in times of stress. 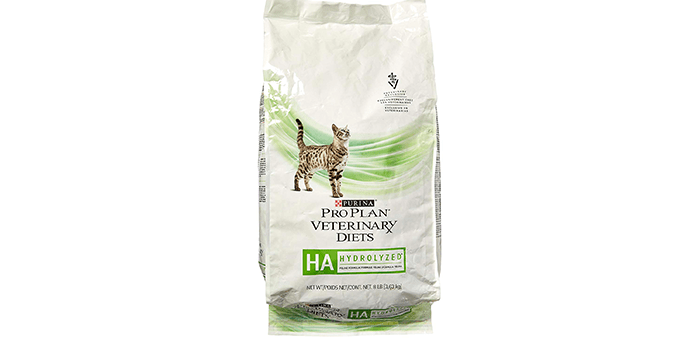 Purina Veterinary Diets Hypoallergenic Feline Formula is a premium grade dry cat food that is recommended for adult cats who suffer from food allergies and food intolerance including dermatitis and gastroenteritis. Thanks to the high level of protein present in its special formula, it helps with reducing and preventing the risks of allergic reactions. Loaded with all natural elements, essential oils and nutrients it supports optimum growth and development of your pet. 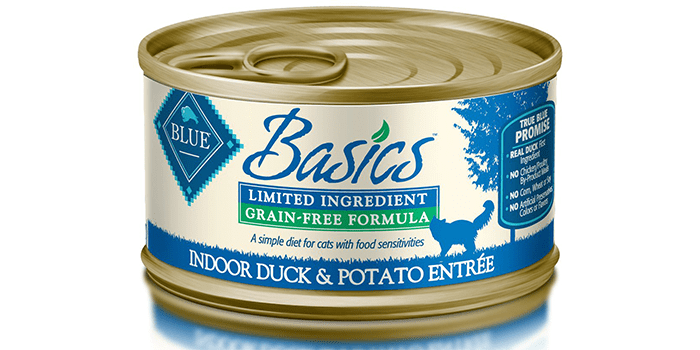 Ideal for cats who have food sensitivities, the Duck & Potato Wet Cat Food from Blue Basics features a unique combination of delicious, premium quality duck meat which is a great source of protein, along with potatoes and peas. Easy to digest and packed with carbohydrates, omega 3 and 6 fatty acids, this grain-free cat food does not contain any chicken, by-products, corn soy or wheat or any kind of artificial flavors, preservatives or color. 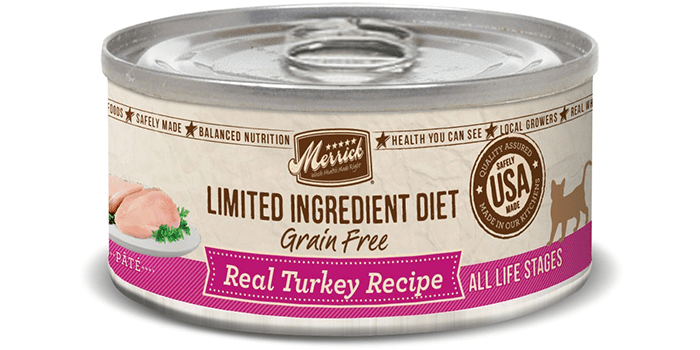 Packed with flavor and real deboned turkey, the Merrick Limited Ingredient Diet Can Cat Food is a premium quality product that is specially crafted for cats with food allergies. Free from grains, fish and gluten, this single source animal protein cat food promotes digestibility and enhances growth and development. Thanks to the omega 6 and omega 3 fatty acids, it aims at improving skin and fur, leaving it soft, healthy, and shiny. 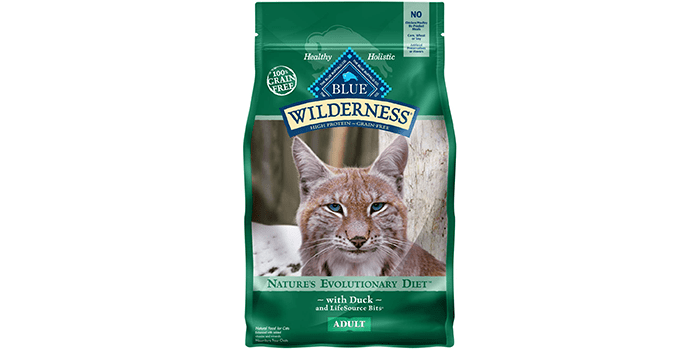 Popularly known for its high protein, grain-free formula, premium quality and exceptional results, the Blue Buffalo Wilderness Natural Adult Dry Cat Food is made to satisfy all the nutritional needs of your feline. Including a single protein source which is deboned duck meat, it helps with optimum absorption of nutrients and supports the digestive health of your pet. Along with this, it also comes blended with Omega 3 and Omega 6 fatty acids that help in enhancing the health of your cat’s skin and coat. With no chicken, no wheat, soy or corn, this premium grade cat food does not contain artificial flavors, preservatives or colors. 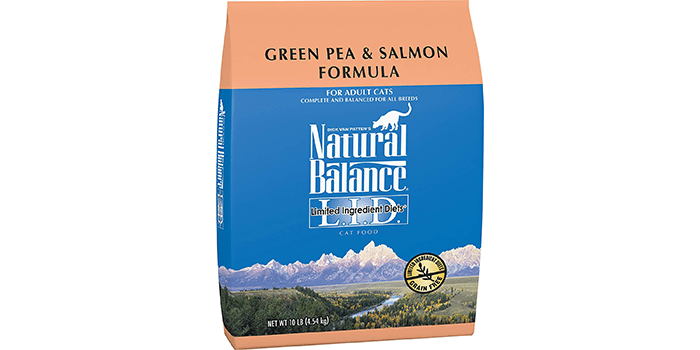 Free from grains and made with premium quality salmon, the Natural Balance Limited Ingredient Dry Cat Food features a delicious and nutritious blend of green peas and real fish that is ideal for adult cats. Including omega 6 and omega 3 fatty acids this high-quality cat food helps support a healthy and balanced digestive system while keeping the skin and coat soft and nourished. Suitable for all breeds, this cat food is certified and tested and complies with all safety and quality standards. 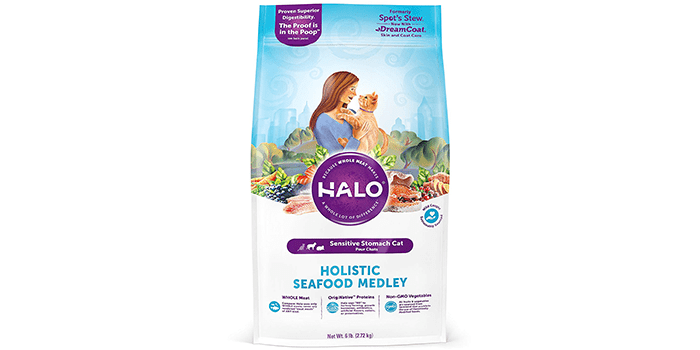 Made with real fish meat, the Halo Holistic Natural Dry Cat Food for Adult Cats is the ideal nutrition for cats with sensitive stomachs. Promoting healthy digestion, it avoids allergies and provides added nutrients, ensuring your cat gets everything he needs to grow and develop. Including whole whitefish, salmon, non-GMO vegetables, and refined grains, it does not contain artificial flavors, preservatives, and colors. Not only does it help with the digestive system of your pet, but it also leaves your cat with a shiny, healthier coat and skin. 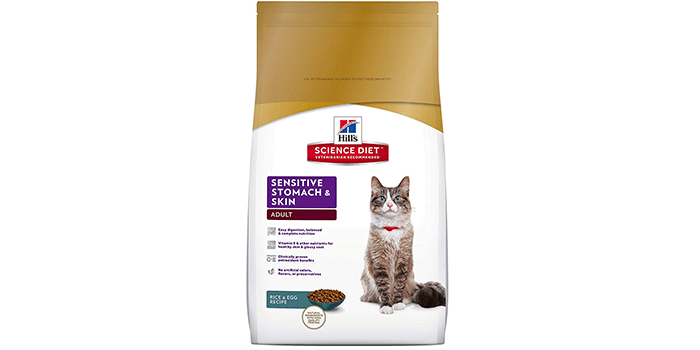 Uniquely formulated for sensitive digestive systems, the Hill’S Science Diet Sensitive Stomach And Skin Dry Cat Food features a delicious rice and egg combination that will leave your cat with a healthy coat and improved skin. Containing a special blend of omega 6 fatty acids along with other important elements, it helps with nourishing your pet’s skin leaving it soft and fluffy. Thanks to its anti-oxidants combined with Vitamin C and Vitamin E, it helps with the immune system as well. Easy to digest, packed with nutritional content, this natural cat food does not contain artificial flavors, preservatives or color. Providing your pet with a complete balanced diet made from all-natural ingredients, the Instinct Original Grain Free Recipe Natural Wet Canned Cat Food by Nature’s Variety aims at improving and supporting the growth and development of your pet. Made with 95% pork liver and salmon along with 5% fruits, vegetables, and other ingredients, this cat food is one that contains high levels of protein. Uniquely blended, it does not contain any potato, corn, soy, grain, by-products, preservatives or artificial colors and flavors. Packed with real meat, this premium quality wet cat food will leave your cat with stronger muscles and a well-developed structure. 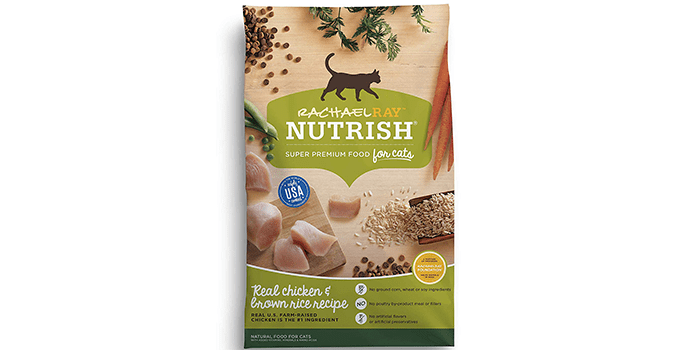 Rachael Ray Nutrish Natural Dry Cat Food is all natural and it includes vitamins, minerals, and taurine. This cat food is blended with real chicken without any by-products or fillers, brown rice, and vegetables. Free from artificial flavors and preservatives, this surprisingly delicious cat food does not come with corn, soy, or wheat, and is completely safe for your cat. Easy to digest, delicious, and packed with all-natural healthy ingredients, this dry cat food helps your cat maintain healthy muscles and an equally healthy digestive tract.